Ben Hands gave Hurst the lead before Tshikume Phadagi equalised for United before the break. 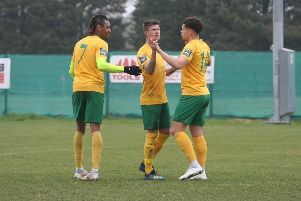 Michael Waller and Kieran Deacon then struck in the final 15 minutes to give the division’s basement-side a much-needed win. The Jubilee Fields-outfit remain 12th with three games of the season to go. Midadje said: “A strong start by us led to a goal by Ben but instead of building on this, and increasing our lead, profligacy in front of goals cost us. “The game should have been out of sight and we should have been four goals to the good. However, with Worthing digging in we let them back in the game when a back pass was intercepted. A good finish from Hands on 13 minutes gave the hosts a deserved lead but from then on Hurst were guilty of spurning gilt-edged chances. First Kai Bichard fired the ball over the bar from just three-yards in front of goal, before Jordan Stallibrass headed onto the crossbar with the goal gaping. And almost inevitably after these misses, Worthing levelled. A calamitous defensive back-pass from Hurst on 33 minutes put Phadagi through on goal who duly fired past home keeper Martin Hopkins. The second period saw the hosts shooting themselves in the foot twice more in the final quarter-of-an-hour. Another defensive mix-up saw Waller take full advantage to put United ahead on 75 minutes. Hurst then gave the ball away on their edge of their own box with eight minutes to go, and Deacon capitalised to make it 3-1. The hosts did have a chance to pull a goal back on 85 minutes but Jake Chadwick missed the opportunity as the ball got stuck under his feet. Midadje’s side host AFC Varndeanians on Saturday. Hurst: Hopkins, Court, Collier, Bowles, Sleat, Luzinda, Bichard, Mahadoo, Hands, Stallibrass, Ndayako. Subs: Beck, Chadwick, Scarff-Cody.